Over- or undervoltage in the system due to malfunction of the regulator or bad ground connection of same. Systems with this type of ignition coil are battery ignitions. They need good battery voltage. If this voltage is at short supply you get in high revs (lots of sparks needed) ignition failures. Also overvoltage may be the reason. Those coils (from about the year 2000 onwards) have an inbuild protection against overvoltage. They simply cut operation when subjected to overvoltage. the engine stops or at least reduces speed. check system voltage at various revs and with or without headlights on. This should be around 14.4V. Significantly over this is dangerous, below 12 you also have a problem. make sure your ground connections are good. possibly replace regulator and/or battery. The 3phase alternator creates a magnetic field which is needed to produce electricity by voltage flowing via the carbons into the rotor. The direction of this field is dependent on the direction voltage is flowing through the rotor (via the collector rings). 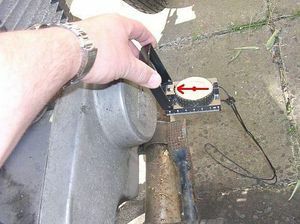 If the wires leading to the carbons which feed the collector rings are reversed, the field also reverses by 180 degrees. It also may be that whoever made this rotor has wound the wire there into the opposite sense (in MZ often the case in post GDR production). It also can be that someone mixed the wires going to the carbons. For the alternator as such, the direction of the field does not really matter. For the electronic ignition with the above mentioned coil it may mean the certain death of the coil, at least it will bring ignition trouble. You may check field direction with a compass. Hold the compass to the outside of the dynamo cover as shown in the picture below. If the needle points with its N marked end towards the engine all is OK, should it point away however you have reversed polarity. Make sure your compass does not read the earths field, so position your bike in a suitable way in which the earths magnetic field does not already make the needle point towards the bike! If you have a reversed field, either use a different sensor (S03) or reverse the wires going to the carbons. After this it please rev the engine for some time with lights on to "burn this polarity in".